Cycling UK, a leading charity who have championed the cause of cycling for well over a century, commissioned Visual Assets to create a contemporary new look for their website. The charity promote all forms of cycling and the website needed to inspire existing and would-be cyclists of all ages. Our task was to create a responsive design that would engage their wide audience group with a clean layout and clear, easy to use navigation across all devices. 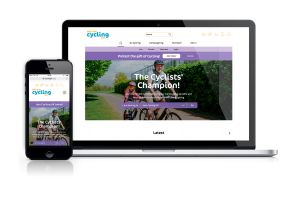 We worked with Cycling UK’s in-house development team to create the site using Drupal – an open source content management solution we’ve been working with for over 15 years.